Today is Food Revolution Day, a campaign started by Jamie Oliver to educate and inspire people to make a positive change to the way children access and understand food. I completely agree with the concept of the campaign. I think that teaching both adults and children to make the right choices when it comes to food is vital. Education in food and nutrition is needed globally. As part of that, we need to teach people how to reduce food waste, as well as how to make sustainable and ethical choices. A massive part of all of this food education is teaching people to cook! Food Revolution is working to bring together all governments to form a plan to tackle the global child nutrition crisis. The more of us that sign up and back the campaign, the more chance there is of getting our governments to make changes. So sign up and spread the word about the Food Revolution! It’s National Vegetarian Week! A lot of people still have a bit of a negative perception of what a vegetarian diet is, and although during the 20 plus years that I’ve been a vegetarian, people’s views have changed, I think there’s still a long way to go to win people over. It’s not all tofu and lentils, though those are some of my favourite things! People think it’ll be a struggle to eat a vegetarian diet, even for one day a week. It really isn’t hard. I think people should give it a try, we’ve all got to do our bit for the environment and eating less meat is an easy way to do it. So, will you miss the meat in your recipes? I don’t think so. OK, I haven’t eaten meat for years but I cook vegetarian meals for my husband and for plenty of my friends who eat meat and they don’t complain, not to my face anyway! It doesn’t have to be complicated. I started to think about how easy it is to switch out meat in most recipes and use a vegetarian alternative. There’s so many vegetarian and even vegan meat fee products available now that you can make yourself a dish that you’d usually use meat for, like a curry or a chilli, instead of adding meat, add something like Quorn. It’s quicker to cook and will still take on the delicious flavours you add into your sauce like a piece of meat would. If you want to try something a bit different that uses Quorn have a go at my easy recipe for Chorizo and Butterbean Stew. Things like National Vegetarian Week, Vegetarian Society and Meat Free Monday are great ways to inform, inspire and educate people, we just need to let people know they’re there. So with plenty of resources available for recipe ideas and for information on nutrition, you really don’t have an excuse! Check out some vegetarian recipes and go for it, even for one day a week, you can do it! Last night was a particularly freezing one in Sheffield, it had been snowing most of the day and we spent the afternoon debating whether we’d be able to make it out to Peddler, a street food market. By the time I’d finished working the snow had cleared from the roads so we decided to go for it. I’m so glad we put our layers on and braved the weather! I’ve been to Peddler before but not since it moved down to 92 Burton Rd. It’s the perfect venue for it. The market started at 5pm, we got down there at about half six and it was already quite busy. I was worried about the weather keeping people away and because it’s not in the city centre I thought it might put people off. I was happy I was wrong, it was great to see so many people there, by the time we left it was heaving! Outside the main entrance to the warehouse were a few food trucks, we had a quick look at these then headed in, first stop naturally being the bar! Under a swath of fairy lights, listening to the DJ, armed with an ice cold pint, yes not the most appropriate choice for a freezing night, we decided to scout out what food options were on offer. There was a variety of cuisines on offer, not masses of veggie options this time but still enough to keep me from going hungry. We spotted a mac and cheese truck, Mac Daddies, I couldn’t pass it by. I’ve not been eating cheese much lately, it turned out to be a rather cheese filled evening! Mac and cheese is one of my favourites, I’ll save my gushing stories of my love of it for another time though. So we were stood in the courtyard in the rain with our beer and mac and cheese next to a fire. It was pretty good. Creamy, cheesy, just what you want on a cold night. After another wander round and a warm by the fires we opted to get pizza from Nether Edge Pizza, we had them cater our wedding so we knew we were in for some delicious wood fired pizza. We had to wait half an hour but when we sat to eat it we weren’t disappointed, definitely worth the wait and it was as amazing as we remembered from last time. Then we bought brownies from Depot Bakery and headed home to enjoy them in the warmth with a whisky! It was a brilliant night, can’t wait for the next one we can make it to, really worth braving the cold. I’m always conscious of wasting food and hate to see things go to waste. We’re part of such a throw away culture now that this has passed on to our eating habits. People waste so much food everyday and others go desperately hungry, it’s just wrong. To see bins outside supermarkets full of perfectly good food being thrown out is awful. I’m a massive fan of cookery shows on TV but when you watch these programs about fancy restaurants and if something is made slightly wrong it gets binned and they start again, it really winds me up! This week I signed up to volunteer with The Real Junk Food Project Sheffield. It’s something I’ve been meaning to do for a while now. I was a little anxious, as I always am before doing something new, but I was excited too. I signed up to volunteer 3 hours of my time helping them prepare for their pop up restaurant event at The Burton Street Foundation. The idea is customers come along to the event and “pay as they feel”. I didn’t know what to expect at all. I arrived, apron in hand, ready to help. Everyone was welcoming and there was a real mixture of people there. After a look round I was taken into the kitchen, the amount of food surprised me. Boxes filled with varieties of fruit and vegetables, piles of artisan bread, baking stuff, tins and loads more all donated from a variety of local shops and businesses. I was put straight into the kitchen to start prepping veg. Chatting away and preparing veg for salad, curry, bakes, sauces and slicing so many huge onions I was in tears! We even baked desserts, banana breads, bread and butter pudding, fruit salads and other bits I’m sure I’ll have forgotten. It was great to see so much food that would more than likely have ended up in the bin being used. Before I knew it, it was 6 o’clock and people had started queuing up to get in to the restaurant ready to eat. Unfortunately I couldn’t stay for the evening but I can’t wait to hear how it went and see the photos from the day, hopefully there aren’t any of me crying chopping onions though! I had a great time and will definitely be volunteering again when I can. Remember not to waste food folks, and if you have extra food then consider taking it to your local food bank or see if there’s a Real Junk Food Project in your area. 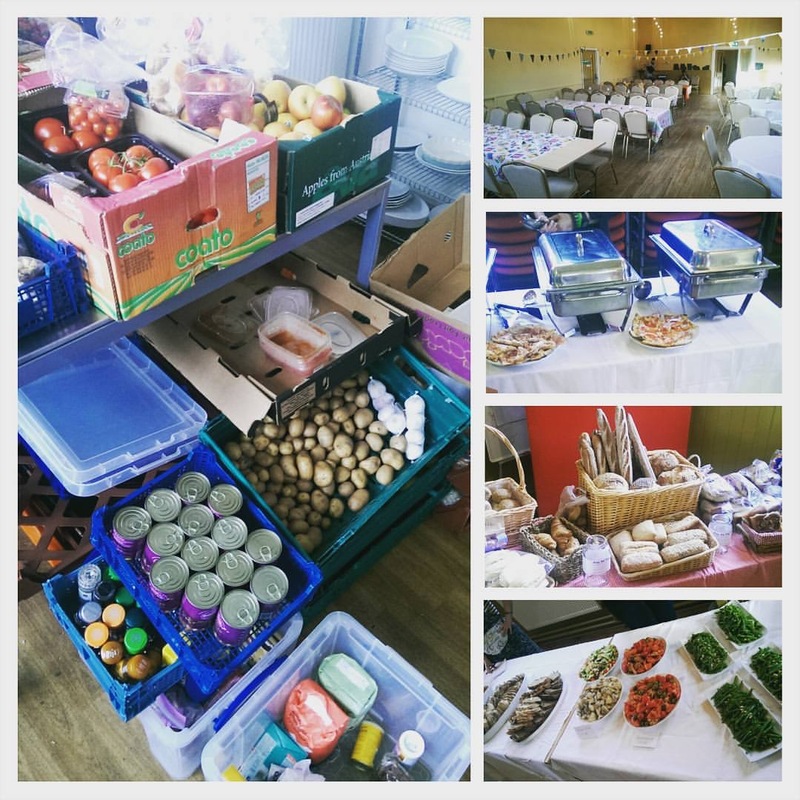 Edit: Just found out that the food we prepared fed 92 people, saved 366kg of food from going to waste and £703.20 was generously donated!